Free range chickens are fun to watch, but hold on a second. 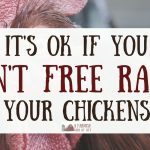 Before you open the coop door and let your chickens run wild, there are some truths you need to know about the free range life. Free Range Chickens Truth #1: There is poop. Chickens poop anywhere they want to. Which includes on the firewood, your front step, next to the car, the fence you didn’t want them roosting on, the neighbor’s front step, the sidewalk, the river rock you just landscaped with, the lawnmower seat…nowhere is off limits. That cute chicken friendly yard project you saw on Pinterest is going to be annihilated with chicken bombs (even though they didn’t show that in the pin). Get comfy with p-o-o-p. And forget about going barefoot in your yard, ever again. If the chickens can get to it, the chickens will probably poop on it. End of story. Free Range Chickens Truth #2: There are predators. I’ve watched full grown chickens (and baby chicks who were following their mama) be carried off by hawks and eagles. I’ve went after the neighbor’s dog who was chasing my chickens. I know that right now a fox is hanging out near our property just waiting for a chance to snap up a free meal. Wait, you say, there are no predators in my area. I haven’t seen anything that would mess with my lil’ chickens. Do you want the straight up truth? Chances are you won’t know what predators you have until you let your chickens out. Death is a real consequence of having free range chickens. Free Range Chickens Truth #3: They bring destruction. Chickens aren’t very clear about boundaries unless the boundaries are made very clear to them. If your garden (flower or vegetable) isn’t fenced (and fenced well), your chickens will be snacking on anything that looks tasty. Chickens are also destructive during dust baths. Dust baths can be fun to watch but they also leave huge craters in your yard—usually in the least convenient spot possible. And be aware: if your free range chickens are hiding their nest of eggs, you might also end up with some surprise hatches! Free Range Chickens Truth #4: You will go on egg hunts. Yes, you’ve provided them with a nice coop, but even the most obedient chicken can get a feather up their bum and lay eggs Elsewhere. If you’re free ranging your hens, plan to do some non-Easter egg hunting. We’ve found nests secretly hidden in our hayloft, the goat’s feeder, nestled into a hollow tree in the woods, the compost pile, in a pile of oats, underneath a stack of lumber, and in a tipped over tote. There are probably many more hiding spots…we just haven’t found them yet. 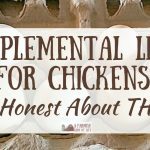 Free Range Chickens Truth #5: You can’t control their diet. You can’t control what a free ranging bird eats. If it’s on the ground and looks interesting, it’s fair game. You’re going to have to explain to your friend who wants vegetarian eggs that your free range chickens are not eating a vegetarian diet. Our chickens have been seen chasing, killing, and eating grasshoppers, worms, snakes, mice, frogs, and many other crawly things I couldn’t identify before they were swallowed up by a hen. Free range chickens are free to roam and fun to watch. It costs less to feed them and your yolks will be the most delicious deep yellow/orange color! But ultimately the decision to free range your birds has a lot to do with where you live, what’s around, and what you’re willing to deal with. It’s important to make sure you know what you’re getting into when you decide to let those birds out to roam free. This just made me laugh and laugh! thank you for sharing! Vegetarian eggs… HAHAHAHA. I am a vegetarian and when I saw that label in the store, I about died laughing. Seriously?! Are people really buying that myth? If they are vegetarian, then those poor lil chickies! AND – We let our chickens free range. We lost two… one being my absolute favorite. It’s definitely not fun, however, my chickens LOVE to wander our property. I don’t want to keep them confined so, I try to have them roam in a huge tree covered area… as best as I can anyways. I am blessed to have a fenced (with field wire) 4 acre pasture. The barn is located within the pasture fence so has one line of defense from predators. AND the back yard is fenced separately, so the dogs don’t mingle with the chickens and the chickens keep their free ranging ways away from the house! That’s the best! You have a great set-up that I hope to have someday soon. So true. I laughed out load while reading the poop part. I prefer chicken tractors moved daily or even twice daily. The key is to not pack the birds in like sardines. I have 19 hens. They are all free Range ( we do put them up at night) We live in the woods on 50 acres of land. In the past 5 years no losses as yet to predators. We only use the eggs and have no plans on eating them…… We live in Mississippi where it is high on TICKS. Kids would come in literally covered in ticks at the end of the day…….Now we have chickens we have NO TICKS. Kids come in with out ticks at all. Most of the time they lay in the boxes…….occasionally we do get the odd egg else where………. besides clearing out the ticks …….their entertainment value is colossal………….. I have 29 hens and 1 rooster… They are free range … They so happy to be free and roam … I hate to have to lock them up on crappie wreather ….. They lay so much better when they can roam …. They are my other kids and definitely spoiled.. Sell my eggs like crazy and get all kinds of complements ….. Loved this! And so very, very true! Forgotten item is the exposure these free rangers gett to all sorts of bacteria, viruses and parasites that the wild birds bring into your yards. These can and do wipe a flock out. So true, especially about the egg hunts! Just when I’ve found the newest spot, they seem to find another one and the hunt is on again! That’s exactly why I don’t let our chickens free range anymore. Everything is covered in poop, they destroyed my garden and there are eggs all over the property. I was cleaning out my greenhouse a couple of weeks ago and I found 24 eggs, no telling how long they had been there but at least 3 months. I grew up on a farm in Texas and never experienced any of this with free-range chickens (other than egg hunting) they generally get the idea when you run them off the porch and away from gardens. After the first few times, they generally stay away from those areas. Consistency is key. Never have we ever had a chicken coop. Never needed one. We never even kept count on how many we had. We knew that we had a lot, but honestly, didn’t quite care. Eggs keep coming, chickens do whatever they do, foxes or coyotes get a few here and there, all is good. Only time coyotes and foxes become a problem is when they start causing a noticeable drop in chicken population. Then we would run them off. Honestly. 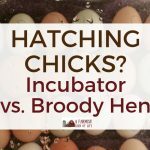 Unless you are living in an area with neighbors (that do not farm), living on a very small farm, or are just picky picky picky, chicken coops are pretty much useless. Chickens don’t care with or without it. They will live in whatever is available and they honestly couldn’t care less. Ours lived in the barn. BTW Chickens care so little that when we tossed out left-over chicken scraps to the wild cats that ran around (keeps them from getting hungry and eating the chickens) the chickens would eat it too. These are all totally true! No one warned us about all the poop! We have two different fenced in areas for the chickens to hang out in but some got brave & started flying over the fence to hang out in the back 3 acres. We lost 3 hens, several chicks, and a rooster to a fox that discovered our backyard buffet. I think the other chickens must have witnessed the rooster’s unpleasant demise, because they all started staying in the fences again after that!